The sequel of 2014 release Velai Illa Pattadhari is written and co-produced by Dhanush himself. Actor-Director Dhanush is on a high in his career with the mammoth success of his debut directorial venture, Power Paandi. The film was widely appreciated for its subtle storyline and great performances by the artists. Dhanush was commended for his direction prowess and well appreciated. Dhanush is currently working on Velai Illa Pattadhaari 2, which is being directed by Soundarya Rajinikanth. 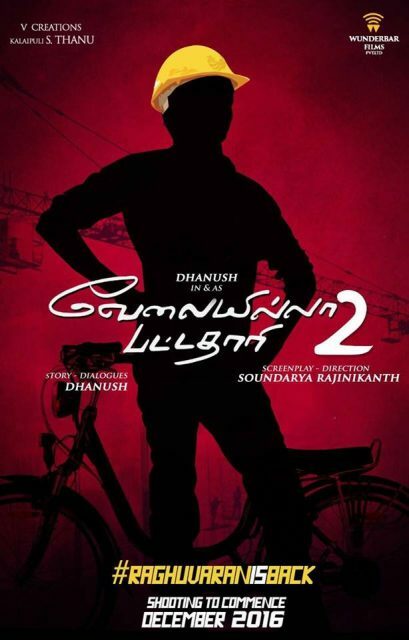 Velai Illa Pattadhaari 2 is the sequel to his 2014 release, Velaiilla Pattadhari, which was directed by Velraj. The story and dialogues of the sequel, Velaiilla Pattadhari 2, are by Dhanush besides co-producing it. The makers unveiled a release teaser of Velaiilla Pattadhari 2 and confirmed that the film will be released on July 28, 2017, that is on Dhanush’s birthday. Velaiilla Pattadhari 2 features the same actors from the first part, adding Bollywood actor Kajol in a pivotal role. The music of the film is composed by Sean Roldan, a newcomer in the Tamil music circles. The prequel had music rendered by Anirudh Ravichander. VIP will be the second film for Dhanush as a writer after Power Paandi. Besides acting, Dhanush is gradually inclining towards direction and screenwriting and is doing a fantastic job in those roles. Power Paandi is an example of his exemplary work and his passion towards story telling. Power Paandi is now being remade in Telugu with collections king Mohan Babu playing the lead role. Mohan Babu will reprise the role of Rajkiran, who essayed the role of a veteran stuntman in Power Paandi.